How Does a Blogger Actually Earn Money? Published October 10, 2018 By Anna T. This post may contain affiliate links. Regardless, I only recommend sites I've researched and/or used and trust. If you've been following this blog for a while, you've probably seen me recommend blogging as a way to work from home for yourself. Granted, it's not a fast way to earn money. But once you've established your online presence, there's a lot of potential to earn an income with your blog. When people ask me what I do from home and I tell them I'm a blogger, the next question to follow that is almost always, “How does a blogger make money?“. Most people I know fail to realize that profitable blogs exist! Doing my taxes last year was a bit of a pain because the CPA I used had never done taxes for someone whose job title was “blogger,” so I had to explain a lot there. So How Do Bloggers Make Money? When people ask me this, I usually just give them the short answer — advertisers. And while that's certainly a large part of it, it's not the only way to earn money with a blog. 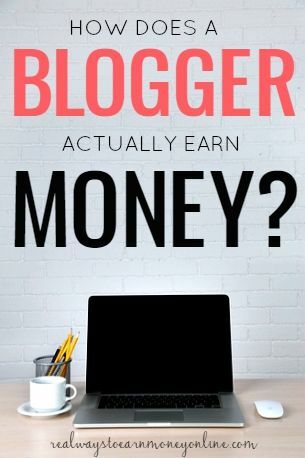 So today I'm breaking down for you the primary ways bloggers earn an income from home, in case you're one of those people who didn't know that blogs can make you money. Ad networks are often the main earner for many bloggers and definitely the easiest to maintain because it's possible to “set it and forget it” once it's in place. Bloggers sign up with popular ad networks like Google Adsense or Media.net and place code in the sidebar, header, footer, or inside posts that will display third party advertisements. These usually pay bloggers a certain amount per thousand impressions or a certain amount per click. Bloggers often sell advertising directly instead of, or in addition to, using ad networks. What this means is that the blogger is in direct contact with specific advertisers and will be able to negotiate rates and approve or disapprove advertisers based on whether or not what the advertiser wants to promote is a fit for their audiences. With ad networks, the blogger doesn't have as much control over these things, so many bloggers do prefer direct advertising because of the amount of control they have. Related: Learn to use Pinterest to drive massive traffic to your blog! This is another form of advertising, but instead of getting paid a flat rate or a certain amount per click or impression as you do with advertisers, the blogger gets paid a certain amount per lead or per sale of what they are promoting. For example, I'm signed up as an affiliate for Ultimate Bundles (as are many bloggers) because they have or have had many blogging and work at home related bundles that will appeal to my readers. I can earn a commission every time I link to one of their offers on this blog and use the affiliate link they provide that is unique to that offer. Then, if a reader clicks through the link and buys or signs up for what I recommended, I will earn a set amount of money per lead or per sale! As a blogger, you have complete control over what products and services you want to promote as an affiliate, so it is possible to only recommend things you approve of. Making Sense of Affiliate Marketing is a fantastic eCourse I recommend if you want to learn more about it. This course helped me increase my income from affiliates by almost $2,000 over what I usually earn in a single month. A blog is an excellent platform for selling your own stuff. I know many bloggers that offer services like coaching, graphic design, virtual assisting, and writing. Bloggers can also sell products like e-books they've written or crafts they've made. Another idea – If you are involved in any direct sales opportunity (example: Avon or similar) you can use your blog as a platform to promote those items and/or build your downline. I don't do a lot of these here, but many bloggers earn money by writing posts paid for by advertisers to promote the products and services of different companies. Most bloggers charge hundreds of dollars for these because it's a form of permanent advertising for companies. However, sponsored posts must be disclosed as sponsored so the reader understands when they see the post that it was paid for by the company. Most bloggers do not do this for just any advertiser and are very selective because it would reflect badly on them to help promote a company that isn't that awesome. Linqia is one example of a site you can use to find these sponsored opportunities to sign up for. How Do Bloggers Get the Money They Earn? As it is with anything, different companies pay in different ways — usually direct deposit, Paypal, or mailed check. However, one thing that doesn't vary much is the frequency of the pay. The vast majority of companies bloggers use to earn an income pay once a month — either at the end of the month, the middle, or the very beginning of the month just depending on their terms. Do you need more help on learning how get blog traffic? Get Elna Cain's Pinterest Masterclass e-course for just $19! I get most of my social media traffic from Pinterest. If you aren't using Pinterest yet for blog traffic — this is worth learning! I recommend Elna's other resources here at Real Ways to Earn and she tends to pack a lot of value in for the price. Check it out here to see if you think it would be worth the investment for you. Post originally published on August 10, 2015. Updated and re-published on October 10, 2018. Useful post, I didn’t know about Linqia. I’ve been working on my own product for a while now and hope to launch it this summer. Affiliate links are okay, but there’s nothing like taking a 100% cut instead of the tiny 4%-7% like Amazon or Etsy. Google Adsense is really a bad option for beginners, they just don’t pay much. Thanks for the good read :). I can’t wait to get traffic to my blog! It’s so hard to get people to follow or even view. It’s so frustrating but I’m going to keep trying. Thanks Anna i found your information very useful now i know what to do. I don’t have your email address. I’ll love you help me with it. I’av some few questions to ask. Hi, you can email me at anna (at) realwaystoearnmoneyonline (dot) com with any questions you may have. Thanks for the information and the links! Well, one good thing is that there are very few blogs out there now that don’t have the affiliate disclaimer somewhere. So I think people are getting used to seeing it. Even though I’ve had people complain, that hasn’t happened for a very long time. I wouldn’t worry too much. Good luck with your site! Anna, I would to hug you!! Thank you so much for sharing! I just started blogging myself and I’m trying to gather all the info I can on it. I hope to one day be a stay at home mom and I’m hoping blogging can make that possible. Is it possible to have the same kind of success with Vlogging? Absolutely. YouTubers are technically “vloggers” and look how successful some of them have become. Great post. I didn’t go to your recommended links yet, but I will be back to be sure that you get the credit through your links :). I just registered my domain a couple days ago, and am just gathering info on how to make a blog I can proud to present to the public! Thanks! Thank you so much! That is greatly appreciated. I really like this post and I think it will help me a lot as I’ve only just begun. Thank you! Thank you. Very informative and helpful. Hello. This was very informative and offered more leads than other posts I have read on making income with your blog. I will have to look into the ShopHer affiliate network. Thank you. Excellent list of blog monetization options… and it doesn’t stop there! Blogging brings about opportunities that will also increase your income and there are ways to expand your blog to earn more online. I linked my name to 11 Unexpected Ways You Can Earn Money From Blogging, in case it will help anyone. Great article. Just getting started with my blog, and this is very helpful on the ‘how’ part of monetizing it. This is some great stuff! Phooey on anyone who think bloggers shouldn’t make money. In fact, I admire bloggers. I became a new blogger last week because my husband cannot work much with his medical condition. This is a livelihood! And it takes guts and hard work to pursue it! I commend you for it and thank you for this! Coming from a new blogger this was some great information to help me out in the long run! Kudos! Anna, thanks for the post! I am one month into my having published my blog (I’ve been toying around with it behind the scenes for over a year) and would love to see it become a steady income in addition to an enjoyable (and hard) hobby. I have struggled to know how to do that, however. How do I drive traffic to my blog? How does that make me money? How do I do any of this? Is it worth it? These are the questions I’ve been asking myself at 1:00 am when I am struggling to make a presentable graphic. Needless to say, I’m excited to read your e-book and enjoyed this post! Thank you for sharing your experience as well as tips to help us bloggers get started. I’ve been doing it for quite some time but recently have been encouraged by others to make turn it into a paid hobby. I am excited to get started! Do you have feedback on Squarespace? That’s the host I am currently using. Thank you again! Thank you! I’m glad you liked it! Unfortunately I have no experience with Squarespace, but I have seen some very nicely designed blogs that use it. Thank you for sharing this. I recently started a blog and have been trying to figure out how to earn money whilst doing it. This information helped! I absolutely loved this Post. I am starting to get more traffic on my site so I have been looking into ways to make it a bit lucrative. I don’t have funds to invest into my site at the moment which is quite annoying and it feels like it is holding me back. However, I really appreciate you sharing this article for when the time comes when I am able to place ads etc. Also, thank you for bringing it to people’s attention that bloggers do deserve to get paid for what they do. There are a lot of things to juggle and it’s nice for someone to shed light on all the work that is involved. Thanks again for everything and good luck on the e-book! You’re welcome! Good luck with your blog! I’m right there with you Joanna. I need to buy a theme and better camera, ect, but I am not there yet. I am not sure when to invest on those things. before the money comes in or after. I tend to recommend the affiliate marketing path to new blogs and bloggers. It takes time to build an audience and until you start seeing a decent amount of web traffic, making money with display ads will be inconsistent. Sponsored posts are a great route, but require you to have an established blog, which again takes time to grow. Always start out with a great blog topic and one that interests you or you have knowledge about, and eventually you will find a way to make some money off of it. How best is it to find affiliates, especially ones with integrity that will pay? Hi Anna! I’m interested in your Pinterest ebook but the page doesn’t seem to be working. Any help would be appreciated! Also thank you for this article, it’s very useful! Thank you! Here is the link to the eBook – https://gumroad.com/l/VVnI Let me know if you have problems getting that one to work. Good luck, and thank you so much! Feel free to email me if you have any questions about what’s outlined in the book, and I’ll provide you some direction if I can. Definitely, Blogging helps in different ways whether it is just the way to share information generously. But, the way if one puts it like mentioned above will work as a great source of income. Nowadays, Ad networks and Affiliates are working far better way to make money online. But one must try all, might you get another way working better for you. Thanks Anna, looking forward for more on this topic. Great info, Anna. Hopefully the world will understand sooner, rather than later, that blogging is indeed a profession. Thanks for spelling out everything that goes on behind the scenes. I have been looking for this! I recently took a huge step forward in the development of my brand by purchasing my own domain. The next step is learning to monetize my website. You’re really not kidding when you say that blogging could easily be similar to a 40 hour work week job. I even find myself working long hours on the weekend. However, I feel that it is fun and allows me to be creative. Out of all the ways a blogger can make money, which do you think is the most beneficial? Great post! Hmm, that’s hard to say because different bloggers have different levels of success with each of the options I listed. For me, it’s half and half ad networks and affiliates. I would suggest experimenting with all of them and see what works best for you. Good luck to you! Hi Anna, I agree with you. Blogger bring the information and honest reviews to the followers. There are also bad eggs among us, some tend to copy and spin content and put in their website. I will continue to update my blog and research product to keep people safe online.